If you need a “sweet” activity for your next party or just something to keep the kids entertained any day, this printable doughnut tic tac toe is just what you need. This simple and familiar game is one that everyone can enjoy. My family loves playing games together. There are plenty of new ones we enjoy and of course, technology has given my kids tons of opportunities for educational games that I adore. And hey, I also love to zone out and play a little TETRIS on my phone every now and then! There’s something I just love about classic games, though. We still play card games like Go Fish and Jenga. Tic tac toe is one of those classic games that I think never goes out of style. It simple, but at my house, it can also get pretty competitive. I love that tic tac toe appeals to all ages. If you have kids in a wide age range, this is something that preschoolers up through teens can both play together. 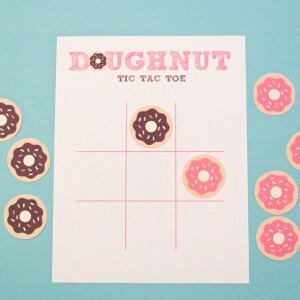 This doughnut tic tac toe game is pretty simple. There are two pages: the board and the doughnut pieces. I made the doughnuts in two contrasting colors – pink and chocolate brown – instead of the traditional Xs and Os. There are 5 of each doughnut, giving you plenty of pieces. Print the game on regular 8-1/2”x11” card stock. Cut out all of the doughnuts. If you have a 2-inch punch, you could use that to make it a little faster. I didn’t cut out the center of my doughnuts, but you could. Just like the original version, players take turns putting a piece on the board and trying to get 3 in a row. Summer break from school is all fun and games – until the kids say those dreaded words “I’m bored.” For a fun party game or activity for any day, print this cute summer bingo game. It’s fun for a group of elementary-aged children. There’s been a lot of nostalgia about the old-fashioned lazy days of summer going around. When I was a kid, I spent a lot of my summer time playing outdoors with my brothers, sister, and neighbors. We also spent a lot of time indoors playing board games. Of course, there were often battles about who was cheating at Monopoly, but we had a lot of fun. I think one of the best benefits of board games is that the kids are learning. Board games are a great way to avoid the “summer slide” by practicing reading and math skills. Playing games with others also teaches kids to be fair, follow rules, and win or lose graciously. 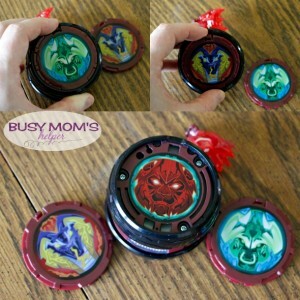 These are definitely skills I want my own kids to keep practicing! On my own blog, One Mama’s Daily Drama, I’ll be doing a Christmas in July feature with a free printable kids’ game every Wednesday throughout the month of July. Today for Busy Mom’s Helper readers, I want to share a fun printable summer bingo game. 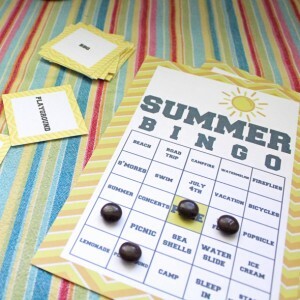 This printable summer bingo game includes 4 bingo boards and 24 cards. I’ve also included the instructions on a cover page. Traditional bingo has one person being the caller, who picks the numbers out of a tumbler. For this version, the cards are placed face down and one person flips over the top card. All of the words have a summer theme. They’re appropriate for elementary readers, but older kids may enjoy playing too. Print the game on regular 8-1/2”x11” card stock. Cut out the boards and cards. You can print extra boards if you’ve got more than four players. We used M&Ms for playing pieces, but anything small that won’t roll away will work. Use buttons, mancala marbles, or pieces from another game.